Commissioned. Buyer provided stone; SeaWeaves glass and weave. Roze created this piece for a customer. What a find! Circa 1899. Back is inscribed with “Heaping Dessert Teaspoon.” From JOHN WYETH & BROTHERS, found on a local beach. John Wyeth & Brothers was a Pharmaceutical Company that started in the mid 1800's in Philadelphia Pa. They provided three major medicines mfg. by their company and they were: Indian Cannabis, Satrontium Salicylate and Hyoscine Hydrobromide. A genuine beach bead set off by incredible detailed hand weaving in silver plated wire. Waves of silver woven wire relinquish a sea-polished bit of glass. 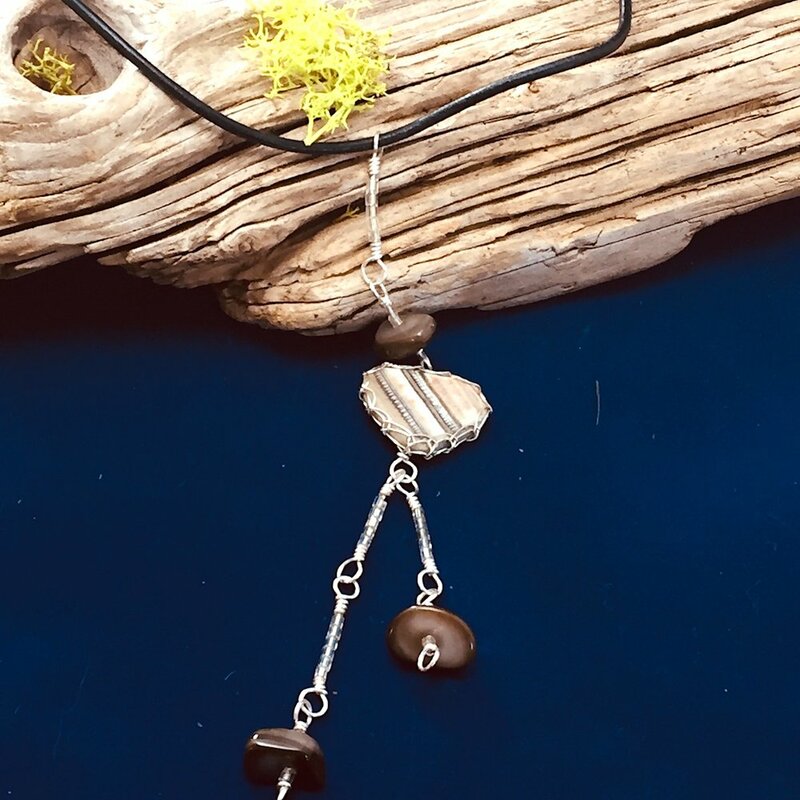 A trio of sea glass bits, vintage beads, and virtuoso weaving highlight this whimsical necklace. 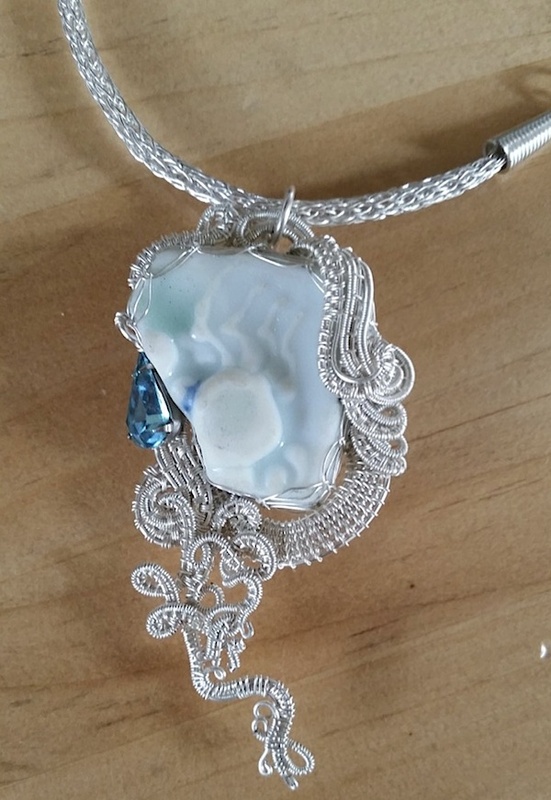 A beautiful blue beach pottery shard is the star of this elegantly woven silver plated choker. Limited edition: Part of the Sea Scrolls series from Roze. 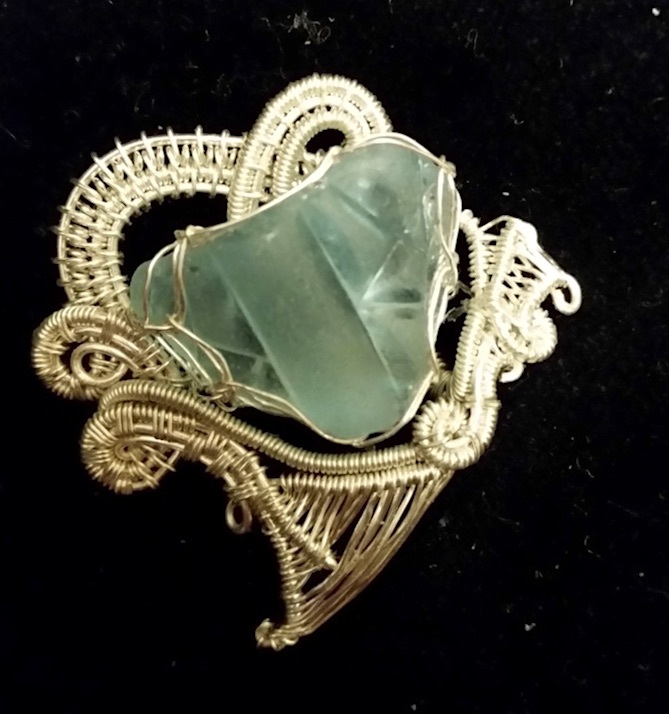 Silver plated wire holds a delightful morsel of green sea glass. Think about it: This is the only piece of sea glass like this in the world. No other piece has been weathered, broken, shaped, and aged like this one. The color is magical; the setting sublime. This necklace will make you cooler. 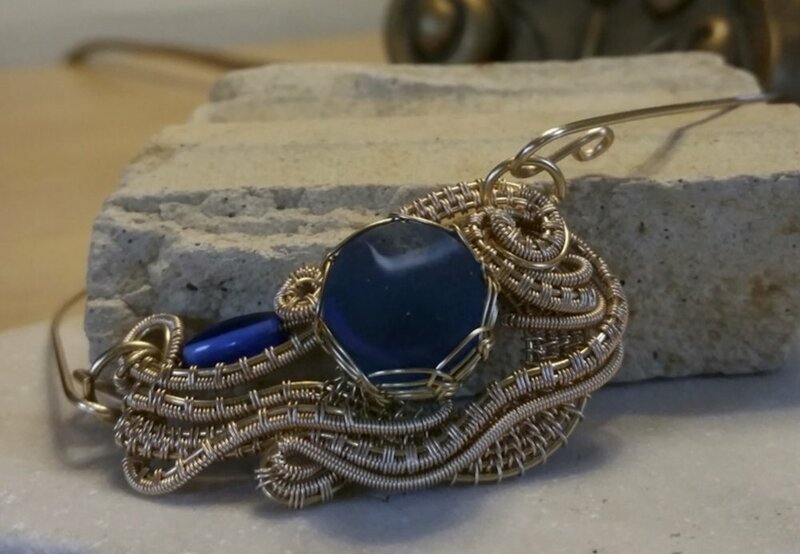 Patterned sea glass stands up to time, set off by woven bronze wire and a recycled vintage bead. 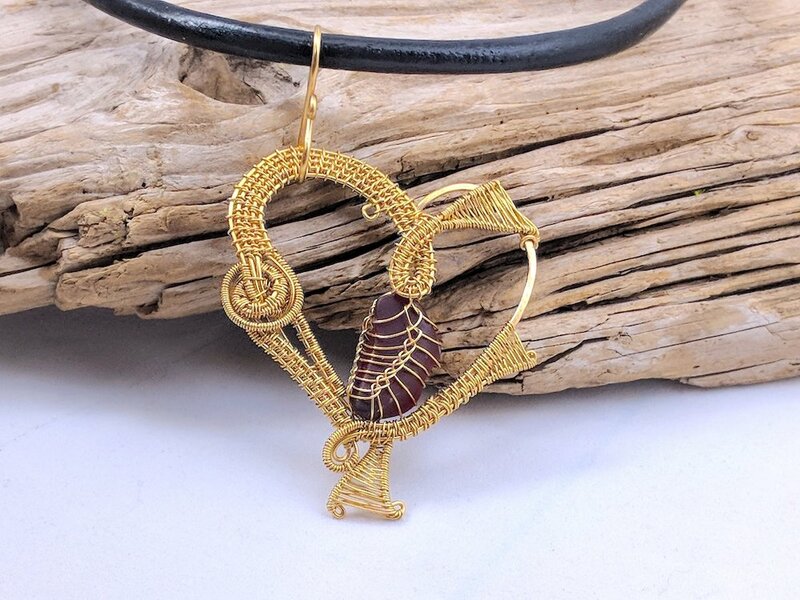 Strung on a 36" leather cord, this piece hangs at mid-chest level. Try to look away; You can't, once you've met the gaze of this pendant that boasts hand-woven leather and two pieces of sea glass. The dark side awaits! A glimpse into the past — a faded flower picked from the ocean. What a way to share your memories of the sea! Hand woven leather, brass and beach pottery. Like many of us of a certain age, this sea glass has seen some stuff. It's battered, but not beaten. Set in a silver-plated woven bandolier, and spotlighted by the contrasting hand-woven chain, this choker says, "I got this." Inspired by Valentine's Day. Home-Tumbled glass and wire. 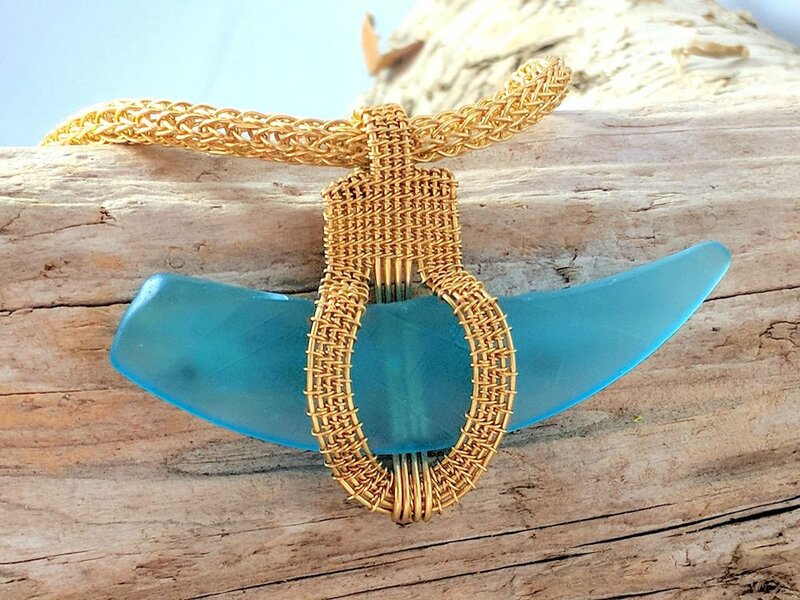 Precise weaving meets a fanciful spirit to show off a subtle shard of sea glass. Gold leather completes the look.